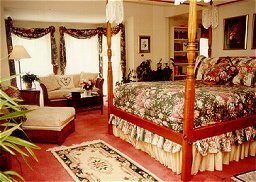 Hosted by Diane and Don Crosby The Village Green Bed and Breakfast Inn has five rooms with private baths including one canopied suite and two rooms with working fireplaces. 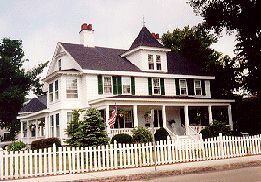 Named for its view of the town's historic village green, the bed & breakfast is situated on the outskirts of the Village of Falmouth. It was Built in 1804 as a Federal-style home and converted to its current Victorian style in 1894. The Village Green Inn was recently accepted into the National Registry of Historic Places. Full breakfasts and a seasonal afternoon beverage are served in this non-smoking inn. Bicycles are available to guests and we are located close to shops, beaches, restaurants, bike path, Woods Hole and the ferry to Martha's Vineyard. Whale-watching is available within 1 hour. Travel-time is less than 2 hours from Boston, Newport and Provincetown.